This trek is one of the most scenic walks in the Ecuadorian Andes. The route goes along the Abraspungo valley. The giant Chimborazo and its neighbour Carihuairazo dominate the area. They are set in an amazing Andean landscape with llamas and vicuñas. It is very common to encounter Indian shepherds tending their animals. Impressive views of snow-capped volcanoes such as Chimborazo, Carihuairazo, Altar and Sangay. Optional climb Carihuairazo (5020m.) during the 4 and 5 day trek. Max. 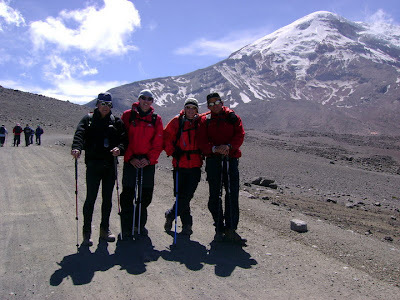 altitude: 4 day trek 4200m./ 5 day trek 5100m.